The Venus de Milo and the Asclepius of Milos were both found on the island, as were a Poseidon and an archaic Apollo now in Athens. Milos is a popular tourist destination during the summer. The municipality of Milos also includes the uninhabited offshore islands of Antimilos and Akradies. The combined land area is 160.147 square kilometres and the 2011 census population was 4,977 inhabitants. 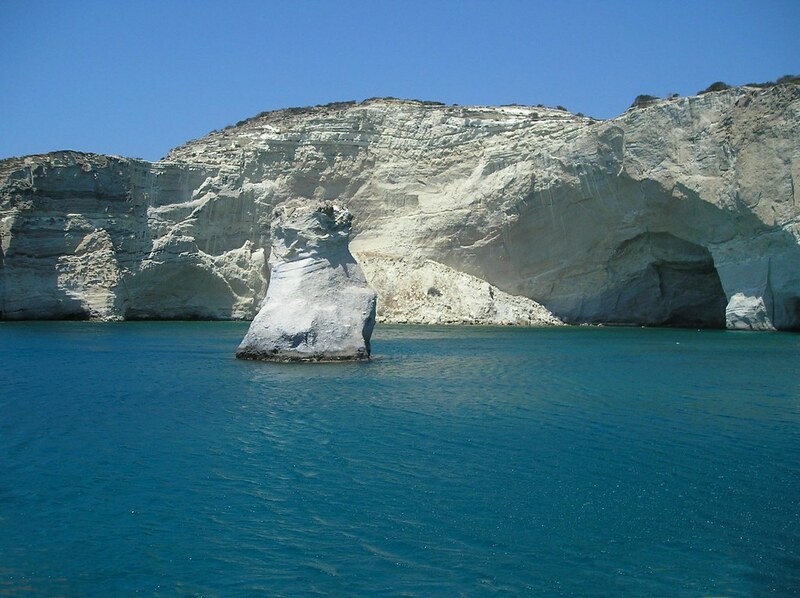 Milos is the southwesternmost island in the Cyclades, 120 kilometres due east from the coast of Laconia. From east to west it measures about 23 km, from north to south 13 km, and its area is estimated at 151 square kilometres. The greater portion is rugged and hilly, culminating in Mount Profitis Elias 748 metres in the west. Like the rest of the cluster, the island is of volcanic origin, with tuff, trachyte and obsidian among its ordinary rocks. The natural harbour is the hollow of the principal crater, which, with a depth diminishing from 70 to 30 fathoms, strikes in from the northwest so as to separate the island into two fairly equal portions, with an isthmus not more than 18 km broad. In one of the caves on the south coast, the heat from the volcano is still great, and on the eastern shore of the harbour, there are hot sulfurous springs. The harbour town is Adamantas; from this there is an ascent to the plateau above the harbour, on which are situated Plaka, the chief town, and Kastro, rising on a hill above it, and other villages. The ancient town of Milos was nearer to the entrance of the harbour than Adamas, and occupied the slope between the village of Trypiti and the landing-place at Klima. Here is a theatre of Roman date and some remains of town walls and other buildings, one with a fine mosaic excavated by the British school at Athens in 1896. Numerous fine works of art have been found on this site, notably the Aphrodite in Paris, the Asclepius in London, and the Poseidon and the archaic Apollo in Athens. Other villages include Triovasalos, Peran Triovasalos, Pollonia and Zefyria. The blue markers shows the location of various accommodations in Adamas. The letter in the marker describes the accommodation types: H for Hotel, A for Apartment, R for Resort, B for Bed & Breakfast and O for Other (e.g. pension, villa). Click on the blue marker for more information on the accommodation.